Photo courtesy of Kelly O’Connor at sittingstill.smugmug.com. Do you remember where you were on the night of November 12, 2010? No? Good, because unless a momentous occasion happened in your life, than it shouldn’t ring a bell. On that night, however, the Red Sox traded lefty relief pitcher Dustin Richardson to the then-Florida Marlins for fellow southpaw, Andrew Miller. The trade didn’t make headlines at the time, since the deal was your run of the mill flier-for-flier swap, but for Boston it was a big part of what eventually landed the team their fifth best pitching prospect. Richardson, who was selected in the fifth round in the 2006 draft, enjoyed varying levels of success in Boston’s minor league system over the course of five seasons. The left-hander spent a brief four game stay on the Red Sox roster in 2009, and then pitched in over 25 games for Boston in 2010. Richardson was traded to the Marlins in exchange for Andrew Miller following the 2010 season. Miller, a former first round pick and the center piece to the trade that landed Miguel Cabrera in Detroit, came to Boston as a diamond in serious need of polishing. The left-handers career in Boston began as a starting pitcher at both the minor league and major league levels. But after starting posting an ERA over 5.00 in 12 games for the Red Sox in 2011, the team relegated Miller to the bullpen. There, Miller excelled and has posted an ERA of 2.57 since being used as a full-time reliever in 2011. With Miller an impending free agent, and the Red Sox well out of contention by the 2014 trade deadline, Boston shipped Miller to the Baltimore Orioles for yet another left-handed starter, Eduardo Rodriguez. The 21-year old is currently ranked the fifth best prospect per SoxProspects.com, and has the ceiling of a number 2 starter at the major league level. 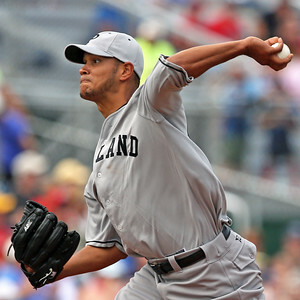 In 2014, the Venezuela native held a 3.60 ERA in 22 starts as a member of the the Bowie Bay Sox and the Portland Sea Dogs. Rodriguez, who boasts an upper 90’s fastball and two plus breaking pitches, also collected 108 strike outs and just 37 walks on the season. From Richardson, to Miller, to Rodriguez, a trade like the seemingly unimportant minor league swap can be the genesis of something quite significant down the road. Tweet of the day: Mookie arrives at The Fort.